So let’s imagine I’m logged in to a Live Virtual Tradeshow (VTS). I’m visiting exhibitor booths, viewing Live Webcasts and interacting with peers. All in all, I’m enjoying myself. I want to spread the word to friends and colleagues. One quick (and efficient) way to do that is to post a message to Twitter. I can “tweet” about the Virtual Tradeshow and pass along a URL to my 141 followers. If any of those followers likes the recommendation, they can “retweet” my message to their followers. If 5 of my followers spread the word and they each have an average of 100 followers, then my message had a potential audience of 141 + (5 * 100) = 641. And that doesn’t even count any downstream distribution via my followers’ followers. If my tweet happens to be picked up by a Twitter power user, my message could be seen by her 10,000 followers! You can see how quickly and efficiently information is published. 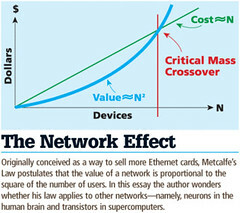 And that’s the beauty of the network effect. As I amass more followers – and, as more users sign up with Twitter – the potential audience of my “tweets” grows exponentially. The result is a powerful tool for B-to-B marketers and publishers, if used right. Publishers need to grow their audience in order to grow their revenue – new audience results in more page views, more ad impressions delivered, more online sales leads. Where can you find that audience? On social networks like Twitter. Of course, Twitter is not the only social network out there (I haven’t even mentioned Facebook and its 130MM users). So while I’ve outlined a few ideas that are specific to Twitter, the bigger picture concept is about integrating the VTS platform with an assortment of networks. The trick will be to pick the right ones. This entry was posted on Monday, December 15th, 2008 at 6:37 AM and is filed under Virtual Tradeshows (VTS). You can follow any responses to this entry through the RSS 2.0 feed. You can leave a response, or trackback from your own site.